KABUL (Pajhwok News) — The Iranian border guard commander arrived at the head of a high-level delegation in Kabul on Tuesday for talks on bilateral agreements and cross-border interactions. Brig. Gen. Qasem Rezaei (قاسم رضائی) and the delegates accompanying him were accorded a warm welcome by Afghanistan’s deputy defence minister at the Kabul International Airport. 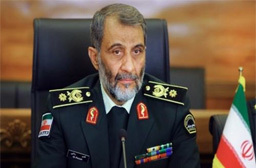 Governors of the neighbouring provinces Razavi Khorasan (خراسان رضوی) and South Khorasan (خراسان جنوبی) and three senior Iranian police officials are accompanying the border guard commander, according to IRNA. Situation along the Afghan-Iranian border, greater border-monitoring cooperation and joint efforts against illicit drugs trafficking, including intelligence-sharing, will be discussed by the neighbours.